If you’ve ever wondered who the fittest airmen in the service are, then prepare for nirvana. 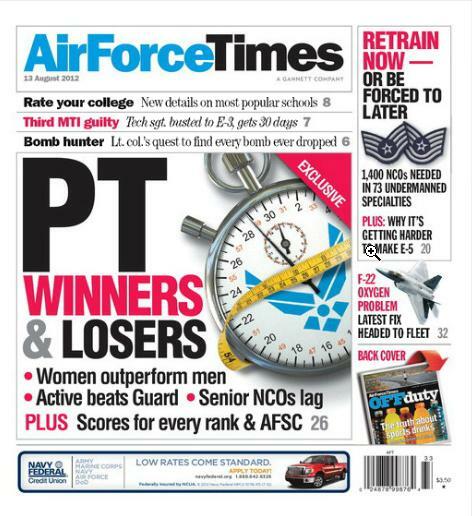 Air Force Times has crunched two years of PT data by major command, gender, paygrade and Air Force Specialty Code to show you who has abs of steel and who is a disgusting fatbody. Meanwhile, more than 3,500 noncommissioned officers have been notified that they could be forced to involuntarily retrain from overmanned to undermanned AFSCs. We have a list of the 39 overmanned AFSCs and the 73 specialties that need people. And an air advisor memorial at Joint Base McGuire-Dix-Lakenhurst, N.C., recognizes eight airmen and one contractor killed by an Afghan colonel in April 2011. Hundreds of people attended the memorial’s July 27 dedication. The incident was the deadliest “green on blue” attack of the Afghan war.